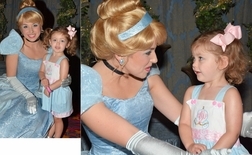 Who doesn't love the Disney story of Cindrella? We just had to use this monogram Cinderella's carriage! So, we decided upon a solid pretty light blue cotton blend fabric and make a dress or swess top (2 inches longer than a regular swing top) and shorts, capris or pants. The bodice is white and the area between the bodice and the skirted portion of the dress/top is embellished with white and pink damask ribbon. The ribbon adorns the hems of the trousers (if chosen) also. 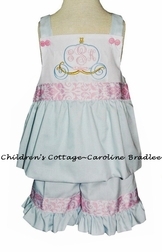 The shoulder straps made of the light blue fabric fasten with 2 lovely pink buttons. The stunning feature of this dress/outfit is the large Cindrella/princess carriage with your little one's monogram inside in our pink Initials 1/curly font. The carriage is made in blue to match the fabric and has pink and gold accents. The bottom of the carriage is shown here in lime green, but will actually be gold on your item. 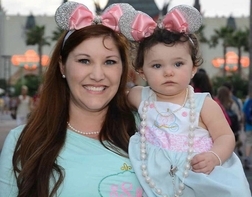 Perfect for trips to Disney, Disney parties and princess birthday parties!